The books will be in chronological order if you listen to the second one first at chapter 21. I did not know that but enjoyed them anyway. Yes due to the fact that from the very first, the characters are introduced and as the story progresses each feeling is described. What was one of the most memorable moments of A Man Called Trent? When Trent discovered he was a man of the west with specific values that he would fight for. Who was the most memorable character of A Man Called Trent and why? Trent, because he had enough forsight to realize that just being a fast gun wasn't enough. He knew the true gun fighter should stay in the background. Kilkenny Brought to Life Through Good Narration! One of my favorite Louis L'Amour western heroes is quiet gunfighter, Lance Kilkenny. L'Amour wrote a trilogy and a few short stories featuring this hero and I have re-read them several times. I was thrilled to catch the first two books in the trilogy put together in audio and on sale. This is the Blackstone Audio Edition and the fabulous Jim Gough narrated. Oh, and just in case yours ends up like mine, the first book in the series, The Rider of Lost Creek and the second, Mountain Valley War, are in reverse order when you click play. No biggie. I just needed to jump to the middle. The Rider of Lost Creek introduces the illusive gunfighter Kilkenny when a range war on the Texas border brings him to the aid of a friend. He soon discovers that there is more going on behind the scenes and the range war might just be the surface not to mention a cold-hearted back-shooting killer is loose on the land. Kilkenny has to be quick with his guns and his mind to keep the situation from turning into a blood bath. At the heart of it all, is Apple Canyon where outlaws hang out and a gorgeous woman who can make even Kilkenny's heart beat faster. The Mountain Valley War sees Kilkenny homesteading peacefully up in a lush mountain valley and not looking for trouble. Then a big ranching operation down in the lowlands figures out that the water and situation is much better in the higher valleys and sets out to drive out Lance and the other homesteaders. Kilkenny must sling on his gunbelt once again and go to war when innocents start getting gunned down by guns for hire. And, he may not be drifting at the end of this battle since the lovely Nita Riordan has waited for him long enough. Jim Gough was a good match for these old-style westerns and I thoroughly enjoyed his lively rendition of both stories. I was glad to have a consistent narrator for both stories since a handful of recurring characters including Kilkenny are present in both. This was quintessential western and just as enjoyable as the first time I encountered them. I love the development of Kilkenny's character even if the others are developed lesser so, the mystery and romance that are often present, but always the thoughtful, descriptive moments and the gritty action scenes. I couldn't tell if the book was good or bad due to the fact I couldn't get past the horrible narration. Over dramatized, every character sounded like they came from a bad cartoon. Not sure what the target demographic was but this is not for me!!!!!!!!!! I very much enjoyed this story. it was well written and very well performed. jim Goth did a good job. I will listen to his next narration as well. Lamour is always a wonderful story writer! Best I've listened to in a long time. i can't wait to listen to more. A Man Called Trent A Western Duo was excellent!!! 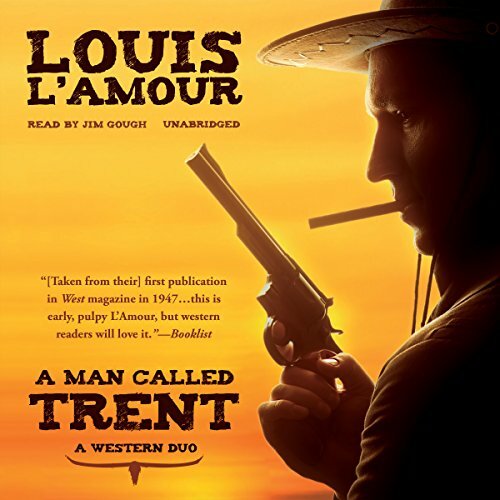 I've been a fan of Louis L'Amour since the 1970's so I figured I'd give this audiobook a try. I loved it! IMHO the narrator made this great story even better. My only nitpick is the the stories are out of sequence. "The Rider of Lost Creek" should come first and "A Man Called Trent" should come next. That nitpick aside, I highly suggest giving these classic action packed books written by the master of Wild West fiction a try. I love Louis L'Amour. I've read all of his books numerous times. Unfortunately, his legacy suffers because of the production of this audio book. The selection of the narrator was obviously for his deep, gravely voice, not for his ability to perform. He reads well but he cannot perform as I expect a professional narrator should. long time Louis Lamour listener, didn't particularly enjoy this one, narration was a bit too dramatic and written at about a middle school level.